Most are familiar with Boston’s ongoing “Big Dig.” Few, however, give thought to the massive amount of waste that accompanies construction on this scale, namely the dismantling of the existing and temporary roadways. 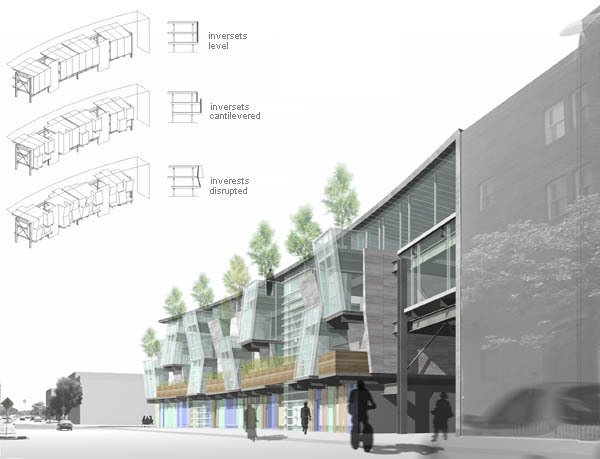 The Big Dig Building proposes to relocate and recycle these infrastructural materials as building components, adapting them to uses ranging from structural members to cladding. Furthermore, as these reused materials can withstand much higher loads than conventional building elements, the social ramifications of “heavy” in relation to “dwelling” can produce new and innovative results. From Highway to Housing: What happens to the millions of tons of discarded materials from obsolete infrastructures like Boston’s Big Dig? Destroying it costs millions to tax payers as well as wastes the embodied energy already stored in the materials. Dismantled and relocated, concrete and steel sections can become structural building modules adaptable to a variety of sites and programs. Load Comparisons: Standard framing (left) can withstand 40 psf – only standard residential objects and programs can be accomodated. The existing highway overpass (middle) is designed for HS20-44 military loading and can withstand 250 psf. 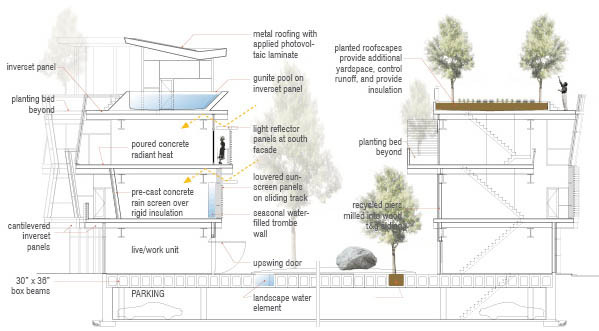 The Big Dig Building using salvaged materials could withstand 200psf – How might a structure that can sustain 4x the load of standard residential construction change the way we dwell? Highway panels are shifted to create an elevation that reads as a vertical landscape. Like a prefabricated system, differing typologies from low to high densities can be created from the same salvaged infrastructural materials. In this light, should not all infrastructural materials be more strategically designed with the second use already in mind? This ‘pre-cycling’ of structure would save them from become obsolete (and thus regarded as trash) and would conserve their massive amount of embodied energy for the lifespan of the material. Cross section: The assembly of infrastructural materials provides advantages such as long span undergroung parking, the integration of water filled trombe walls, and the ability to incorporate full scale landscapes on roofs and balconies. Because of the ability for the materials to carry heavy loads as well as span long distances, new programmatic freedoms can evolve. 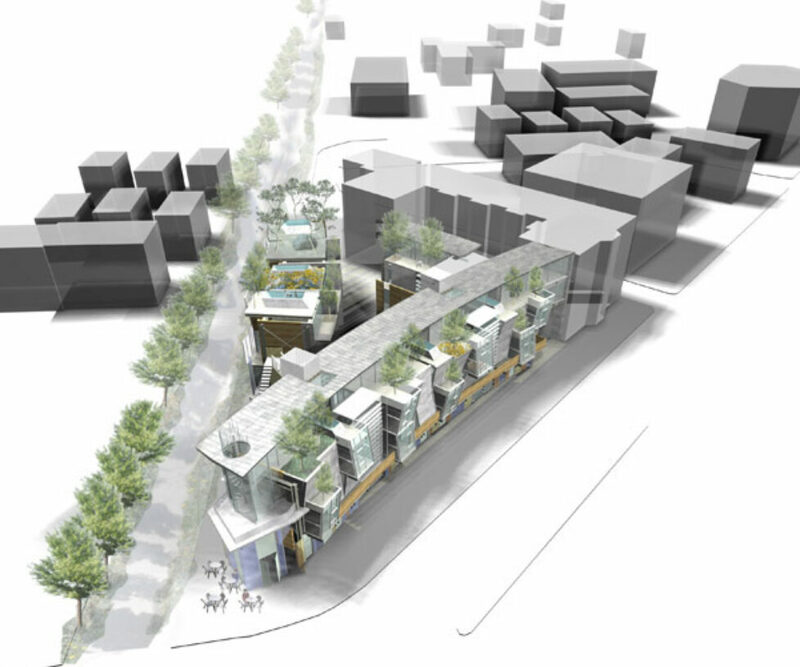 Family playgrounds can be introduced into upper level units to provide immediate access to the outdoors (left), libraries and other heavy loads can be sustained within each unit (middle), and long spans making continuities between inside and outside can be achieved (right). Paul Pedini, Jay Cashman, Inc.